Adventures often start with serendipity mixed with a little bit of boldness. Umbra Institute Kate Crowley happened on just such an admixture this past weekend when, in nearby Spoleto for a hike, she saw an advertisement for the Quintana. 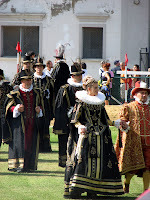 The Quintana is Umbrian city Foligno’s yearly Renaissance festival. Traveling alone, Crowley negotiated the flag-bedecked streets of Foligno’s various competing neighborhoods and was able to see most of the final joust, where horseback riders must spear small rings to win the joust. The Quintana is just one of the many local festivals waiting for Umbra students to discover them!